Our Abpromise guarantee covers the use of ab70314 in the following tested applications. WB 1/5000 - 1/15000. 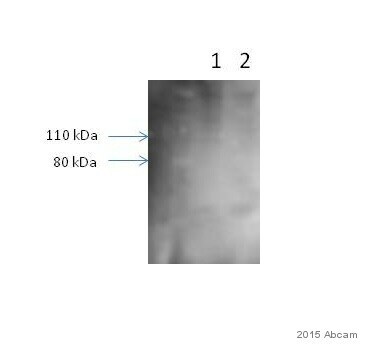 Detects a band of approximately 85 kDa (predicted molecular weight: 71 kDa). IP Use at 2-5 µg/mg of lysate. IHC-P 1/200 - 1/1000. Perform heat mediated antigen retrieval with Tris/EDTA buffer pH 9.0 before commencing with IHC staining protocol. Transcriptional activator which triggers apoptosis in the absence of survival factors, including neuronal cell death upon oxidative stress. Recognizes and binds to the DNA sequence 5'-[AG]TAAA[TC]A-3'. Note=A chromosomal aberration involving FOXO3 is found in secondary acute leukemias. Translocation t(6;11)(q21;q23) with MLL/HRX. Contains 1 fork-head DNA-binding domain. In the presence of survival factors such as IGF-1, phosphorylated on Thr-32 and Ser-253 by AKT1/PKB. This phosphorylated form then interacts with 14-3-3 proteins and is retained in the cytoplasm. Survival factor withdrawal induces dephosphorylation and promotes translocation to the nucleus where the dephosphorylated protein induces transcription of target genes and triggers apoptosis. Although AKT1/PKB doesn't appear to phosphorylate Ser-315 directly, it may activate other kinases that trigger phosphorylation at this residue. Phosphorylated by STK4 on Ser-209 upon oxidative stress, which leads to dissociation from YWHAB/14-3-3-beta and nuclear translocation. Phosphorylated by PIM1. Cytoplasm > cytosol. Nucleus. Translocates to the nucleus upon oxidative stress and in the absence of survival factors. Lane 1 : MCF7 Cell Lysate Immunoprecipitated with ab70314 at 6ug/mg. Decction: ECL for 3 minutes. Immunohistochemistry (Formalin/PFA-fixed paraffin-embedded sections) analysis of human ovarian carcinoma (left) and mouse renal cell carcinoma (right) tissues labelling FOXO3A with ab70314 at 1/500 (2µg/ml). Detection: DAB. ab70314 has not yet been referenced specifically in any publications. Publishing research using ab70314? Please let us know so that we can cite the reference in this datasheet.